Marcus Servilius legatus (legate) was a general in the Roman army who was of senatorial rank. He was typically second in command to the Proconsul (provincial governor), and outranked all military tribunes. In order to command an army independently of the Proconsul, legates were required to be of praetorian rank or higher; a legate could be invested with propraetorian imperium (legatus pro praetore) in his own right. Legates received large shares of the army’s booty at the end of a successful campaign, which made the position a lucrative one, so it could often attract even distinguished consuls. 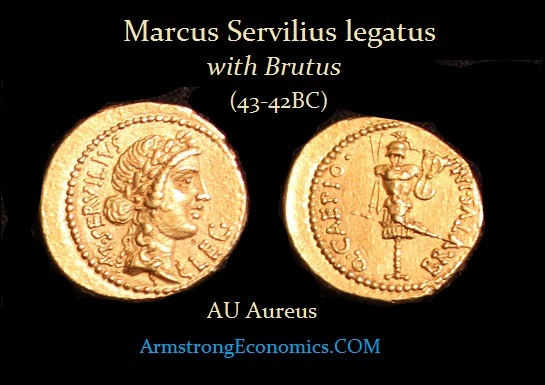 Marcus Servilius legatus struck coinage for Cassius and Brutus in both silver and gold.